Today's lab involves solving Sudoku puzzles using recursion. If you are already familiar with Sudoku, you can skip the introduction section. 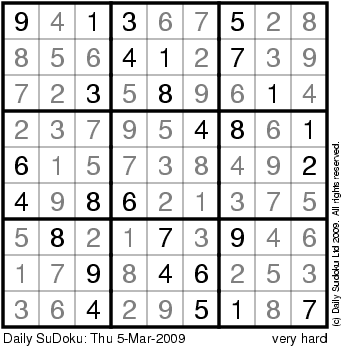 An example of a Sudoku puzzle is shown below. The original puzzle is shown by the black numbers, and the gray numbers are the solution. There are a variety of different ways to solve Sudoku puzzles manually and automatically. Since writing one from scratch would be far too complicated to finish by the end of a single lab session, all of the algorithm will be described in detail and much of it will be given to you. Before discussing the algorithm, we note that two new concepts are used in this lab. If you know what sets are in mathematics, Python sets represent this concept, so you only need to look at the example Python code. Using numpy and Python lists, you've created pseudo-matrices by creating lists of lists. For the Sudoku solver, we use a matrix from numpy. The only noticeable difference you should see is that instead of retrieving an item at a coordinate using “matrix[row][col]”, you retrieve it using “matrix[row, col]”. Sudoku puzzles are represented as 9-by-9 matrices. The initial puzzle has certain cells filled in with numbers and the rest are 0, to signify emptiness (since numbers are between 1 and 9, inclusive). Find the next coordinate starting from [row, col] that is empty (has a 0) or stop if we pass the end of the puzzle. From [row, col] we look left to right, top to bottom for the first empty cell. If we passed the end of the puzzle (if we get to row 9) in the loop, all cells in the puzzle are filled, so the puzzle is solved. Therefore, we can return true. Otherwise, we start try put all possible numbers for the cell at [row, col] are. To do this, we declare a set F, which stands for forbidden values. The three loops following the declaration add numbers to the set from the same row, column and 3-by-3 sub-grid. We assume that the current number is the correct value for the cell, so we set that cell equal to that number. Next, we get the next coordinate (not necessarily empty, since step 1 finds the empty cell) from the current coordinate. This can be done using the next_coordinate() function, as it was above. Now, attempt to solve the puzzle starting at the next coordinate by making a recursive call. If the attempt was successful (it returns true), then also return true, because the puzzle has been completely solved. Otherwise, do nothing (which will continue to the next iteration of the loop trying all legal values). If we've completed all of the above steps without having returned true, that means we've exhausted all possible values for the current cell with no success, so change it back to an empty cell and return false. Your task is to complete step 4 in its entirety. All other steps have been completed, so don't try and write them on your own. This section is not related to the actual lab (but it is related to the percolation project), so complete the lab before you read this. If the current coordinate has reached the end, return indicating success. For Sudoku, this means the row after the last row; you can use the same idea for percolation too, but this is a design decision. The concept remains the same. A set of values is used to test a cell. In a Sudoku puzzle, it's somewhat complicated to determine this set, since it involves retrieving numbers from the same row, column, and 3-by-3 sub-grid as the current cell. For percolation, it's quite easy: there can either be flow or not. The algorithm recurses on (calls) itself, assuming that the value in the current cell is correct. The function call that does the recursion does so on neighboring cells that make sense. For the Sudoku puzzle, there is only one cell that makes sense, so this is trivial. However, for the percolation algorithm, it must possibly consider cells directly to the north, south, east, and west of the current cell. This means that you probably have to recurse more than once. If one of the recursive calls indicates that it has been successful, then we can propagate this indication. For both cases, this simply means returning true. If none of the possible values has resulted in success, we've exhausted our options for this cell given the assumption that all previous cells are correct, so revert state if necessary and indicate failure. In Sudoku, reverting the cell state to be empty is necessary to make future guesses at that cell. Is this a good idea for percolation? Recursively solves a Sudoku puzzle starting at the given row and column. Note that the second assumption does NOT imply that the puzzle is solvable. # cell in the current box. # 1 and 9 not creating a conflict with earlier values currently in M.
# a solution. Set the cell back to empty and return False.